Let us bring the Revolution to life for your school or event! 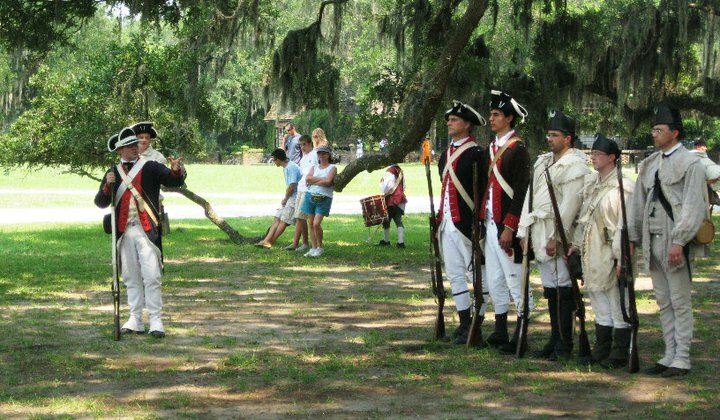 In the past 30 years, the re-created 2nd Regiment has worked with countless schools, scout groups, historic sites and civic organizations throughout South Carolina to educate the public about the lives of soldiers and their families in the Revolutionary War. Our presentations have ranged from single members working with small groups to full day or overnight events involving entire schools in a highly interactive setting. We have also worked with businesses and corporations that wanted to add an authentic living history component to their patriotic or historical-themed events. We would be happy to talk with you about working with your group. We have limited availability during the week, as most of our members work full-time, and many of our weekends are dedicated to living history events or battle reenactments. The earlier you contact us, the greater the chance we can put your event on our schedule. We do not charge a fee for working with schools or non-profit groups, but an honorarium at least covering expenses is appreciated. Fees for appearing at business or corporate events vary, depending on your needs. There is one stipulation for any event: soldiers must be allowed to carry their muskets and bayonets. It is unrealistic and impossible to accurately discuss soldiering in the 18th century without having the unique weapons of the period on hand. We do not have to fire the weapons or even bring ammunition (though some school groups have gotten permission for us to do so). We can discuss weapons policies, laws and options from our perspective; be prepared to discuss your local situation with us when scheduling your event.